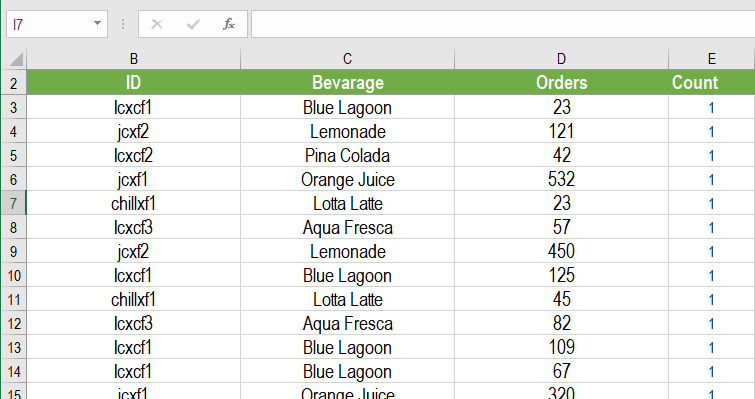 A pivot table in Excel is an excellent tool for analyzing data. It helps you to aggregate, summarize, finding insights and present a large amount of data in a few clicks. It is also very flexible and can be changed without much effort. You can sort a large amount of data very easily using pivot tables. 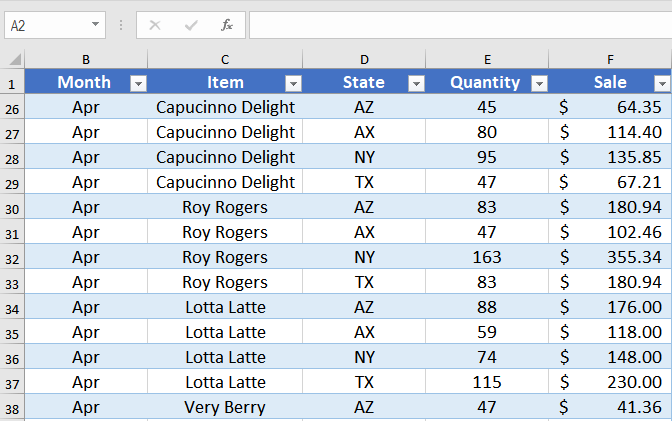 In this tutorial, we will see how to sort a pivot table based on two or more columns. In this example, you will use the quarterly sales data of Jingo Juice corner. The data consists of quantity and sales for beverages during the 2nd quarter of the year through four states. 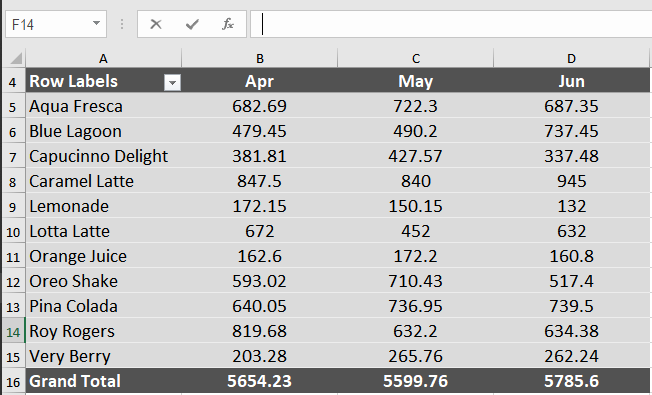 The pivot table aggregates the items based on months and shows the sales. The original data had 133 entries which are summarized very efficiently with the pivot table. You can sort a pivot table in ascending or descending order like any other tables. You can sort the labels and the fields. To sort the labels, you click on the filter icon beside it. From there, select “sort A to Z” or “sort Z to A” to sort in ascending or descending order. To sort any pivot table field, you need to click anywhere in the column and click sort in the Data tab in the ribbon and select how you want to sort. Click the filter icon beside “Row labels”. Select “sort Z to A”. This will show the items in descending order. You can also select “More sort options” to fine-tune your sorting. Click on Data > Sort. 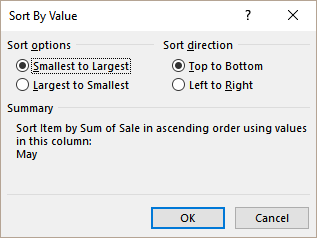 Select “Largest to Smallest” as sort option and “Top to Bottom” as Sort direction. This would rearrange the table based on the sales in May in descending order. Normally, it is not possible to sort a pivot table based on two columns. However, with a workaround adding a calculated field, it is possible to sort two columns in a pivot table. 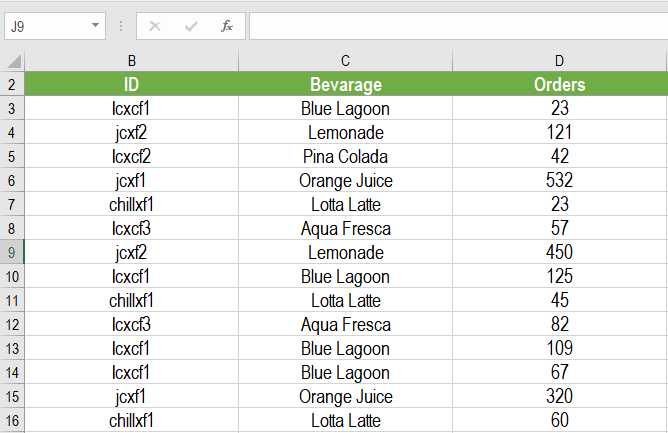 For this example, you will use the order data for the beverages from the previous example. The data contains the beverage ID, name and total orders. 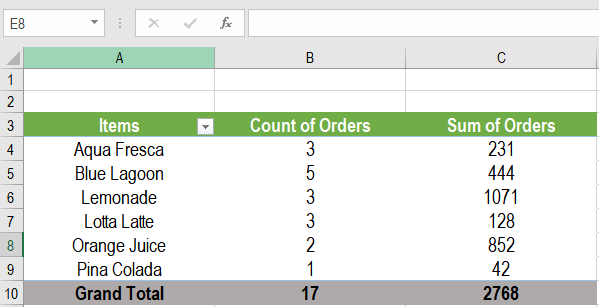 The pivot table shows the Item names, order count and total orders. At first, you would need to add an extra column to your data table. Name it “Count.” Set the value of cell E2 to 1 and drag it down to the cells below. Click anywhere on the pivot table. 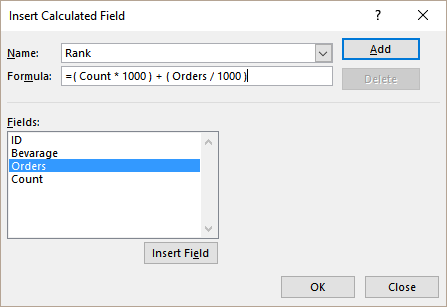 Go to Analyze > Fields, Items and Sets > Calculated Fields. Now the calculated fields will have the desired ranks. To sort it select the cells D4:D9. 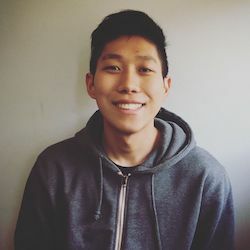 Go to Data > (Sort) Z – A. This will sort the pivot table in the desired way. Now to hide the rank column right click on the column name on top and select Hide. Power pivot is an add-in for Excel used to perform powerful data analysis, data modeling and gather business insights. It can handle large volumes of data from different sources in a single Excel file. Click COM Add-ins in the Manage box > Click Go. Check the box for Microsoft Office Power Pivot > click OK. Select the Power Pivot add-in for Excel if you have other versions of Power pivot installed. 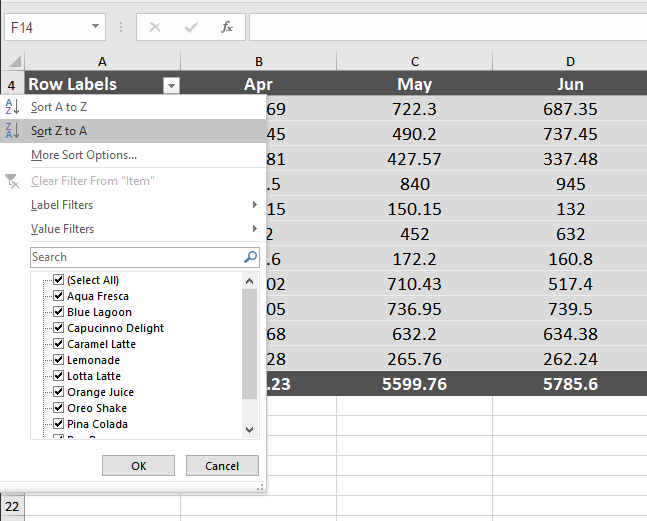 On the power pivot window click PivotTable. Check New worksheet and click OK. Now in the pivot table, set the “Items” as row and “Rank” as values. Go back to the power pivot window. Select cells 1:11 having the item names and go to Home > Sort by Column. 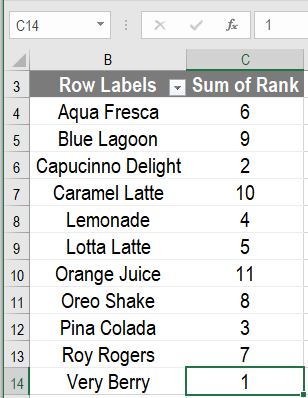 Set “Items” as the sort column and “Rank” as the By column. 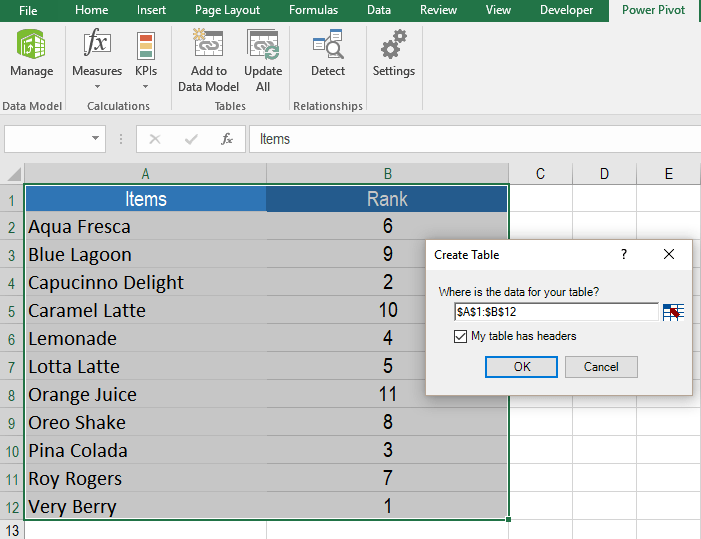 This will sort the items based on ranks in the pivot table. Power Pivot can sort multiple columns as well which is a lot simpler than sorting in pivot tables. Pivot tables are a great way to summarize and aggregate data to model and present it. Power Pivot is also another great tool to gain business insights. There are many interesting features of Pivot Table and Power Pivot that could help you gain insights into your data. If you want to save hours of researching and frustration and get to the solution quickly, try our Excel Live Chat service! Our Excel experts are available 24/7 to answer any Excel question you have on the spot. The first question is free. 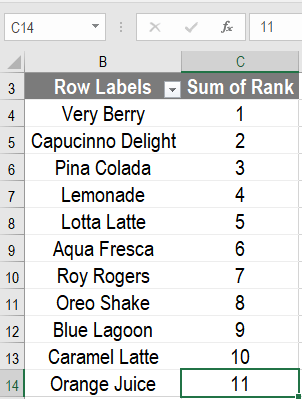 How do you combine two pivot table columns? I need help sorting a sheet by 2 different columns.